In 1513, Spanish conquistador Vasco Nuáez de Balboa crossed the isthmus of Panama and claimed the entire Pacific Ocean, and all the shores that it touched upon, for Spain. The unfettered Spanish illusion of Pacific dominance would endure for two-and-a-half centuries. As early as 1527, Spanish galleons were sailing between Mexico and the Philippines. By 1564, Captain Alonso de Arellano confirmed Westerly winds could allow for annual cross-Pacific voyages. As for approaches to present-day British Columbia, strong circumstantial evidence supports a claim that Spanish-employed navigator Juan de Fuca (actually a Greek named Valerianos) entered the Strait of Georgia at 48 degrees north in 1592; it has been confirmed that Sebastián Vizcaino, a shipmate of Juan de Fuca, led a voyage that reached 43 degrees north on the Oregon coast in 1603; and during a voyage from Manila to Acapulco, a Spanish galleon named San Francisco Xavier was shipwrecked on the Oregon coast, near Nehalem Beach, in 1707--but for the most part Spain was content to leave the North Pacific unexplored. Unless advance permission was granted from Madrid, all foreign sailors on the Pacific Ocean were to be treated as enemies in keeping with the Real Cédula law of November 25, 1692. Consequently, in 1773, Spain was perturbed to learn from their ambassador to the court of Empress Catherine in St. Petersburg that Russian-sponsored expeditions from Archangel and Kamchatka in Siberia had been sailing, for at least nine years, to the so-called "eastern coasts" off Siberia. In addition to these unsanctioned incursions on the great "Spanish Lake," the Russian Empress had provided a monopoly to a fur trading company in Kamchatka that had established a settlement on the American coast at the 64th parallel north. The Spanish promptly dispatched their most experienced navigator on the west coast of Mexico, Juan Pérez [see entry], to sail northwards to investigate Russian activities. 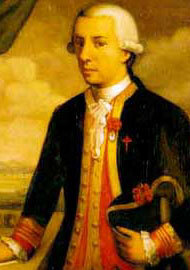 Although Pérez failed to directly contact any Russian traders, he did confirm their presence in North Pacific when he traded with Aboriginals at the north end of the Queen Charlotte Islands in 1774, thereby gaining the little-known distinction of becoming the first European mariner known to have entered the territorial waters of present-day British Columbia. A follow-up expedition or reconnaissance, one that included Don Juan Francisco de la Bodega y Quadra, was sent from San Blas, Mexico, in 1775. The man commonly referred to in Canada as Quadra--but properly known throughout Spain, United States, Peru and Mexico as Bodega y Quadra--would become the most highly-regarded of all the numerous Spanish captains who reached the Pacific Northwest coast prior to 1800. Born in Lima, Peru on May 22, 1744 as a member of a noble Basque family, Quadra graduated as a midshipman from the Naval Academy in Cadiz, Spain in 1767 and arrived in New Spain in 1774. The following year he participated and later led the second Spanish naval voyage to sail as far as present-day British Columbia and the first to claim sovereignty over Alaska. During this voyage he reached the top of Kruzof Island (latitude 57 degrees, 18 minutes North) and Bucareli Bay (latitude 55 degrees, 14 minutes North). Initially Bruno de Hezeta commanded the frigate Santiago, with Bruno Hecate as his pilot-after whom Hecate Sound is named-while Bodega y Quadra was placed aboard the much smaller Sonora (La Seáora) under Captain Don Juan Manuel de Ayala. Bodega y Quadra was given command of the La Seáora after the captain of a third ship accompanying them as far as San Francisco Bay reportedly went mad, causing Ayala to switch ships, whereupon Francisco Maurelle became Bodega y Quadra's pilot. In July, Quadra's crew encountered violent resistance on the Washington State coast when seven Spanish/Mexican sailors were massacred by more than 200 Indians at a place they called Punta de los Mártires, or Martyr's Point, now believed to be Port Grenville. Bodega y Quadra and Mourelle persisted in their tiny schooner (only 36 ft. by 12 ft. by 8 ft.), despite scurvy and a reluctant crew, making realistic charts as far as Kruzov Island, Sitka Sound and Bucareli Bay on Prince of Wales Island. They named Bucareli Bay after the Viceroy of Mexico and Quadra named the body of water now known as Dixon Entrance after his Spanish precursor, Juan Pérez, who reached the Queen Charlotte Islands in 1774 in the Santiago. North of Sitka, the Spanish found a crudely constructed shelter where they erected the first Spanish cross on the coast of the Pacific Northwest. Not encountering any Russians, the Spanish formally declared Spanish sovereignty over the northern coast in the name of Carlos III, King of Spain and the West Indies. They conducted a Christian ceremony on August 18, 1775 at Salisbury Sound, Alaska, a place named Puerto de los Remedios by the Spanish. Maurelle oversaw these ceremonies because his captain was ill. Like Pérez, Quadra saw the Queen Charlotte Islands but did not attempt to land. By 1778, the English captain James Cook had arrived at Nootka Sound on the Pacific coast to take possession of "territories useful"; to England, but the Spaniards were still unaware of Cook's achievement when Bodega y Quadra, in La Favorita, undertook his second voyage north, with two frigates, in 1779. Again sailing from San Blas with Mourelle, Bodega y Quadra and his associate commander Ignacio de Artega reached Hinchinbrook Island at the entrance to Prince William Sound, Cape Elizabeth at the entrance to Cook Inlet and Kodiak Island in Alaska before turning back due to illness. The apprehension of Colnett by Martinez at Nootka Sound led to serious diplomatic exchanges between London and Madrid. On October 28, 1790, Spain and England signed the Nootka Bay Convention providing for mutual territorial rights and mutual access. Each country named commissioners to oversee the loose terms of the truce. They were Captain George Vancouver and Captain Bodega y Quadra. During Bodega y Quadra's four months at Nootka, his diplomacy and friendship with Maquinna prevented an uprising that was planned by the rival chiefs Wickaninnish, Tatoosh and Cleaskinah (aka "Captain Hanna";), the chief of the Ahousat. When Maquinna prevailed upon one of the malcontents, Hannah, to come to Yuquot and meet Bodega y Quadra, the Spanish captain was so persuasively charming that Hannah decided to forego plans for an uprising. "These people can never expect to have among them a better friend than Don Quadra,"; observed the American fur trader Joseph Ingraham, master of the Hope. "Nothing can exceed his attention and kindness to them, and they all seem sensible of it and are extravagantly fond of him. "; In short, Bodega y Quadra set a standard by which other Europeans would be judged. In the company of their host Chief Maquinna, Quadra and Vancouver amicably agreed to call the island "the Island of Quadra and Vancouver"; but they were unable to clarify the terms of the Nootka Convention. Instead they opted to defer intricate negotiations to their respective governments. Quadra left Nootka Sound in the Princesa in late September. The need to resolve the English/Spanish territorial dispute subsided as European powers came to accept there wasn't any viable sea passage from the north Pacific to the Atlantic. As well, an over-supply of sea otter furs glutted the market in the Orient, reducing prices. England and Spain signed another agreement on January 11, 1794 that relieved diplomatic tensions. The Nootka presidio built by the Spanish was dismantled on March 23, 1795 marking the end of Spanish dominance on the West Coast of Canada. The last Spanish voyage north of California would be made by Juan Tovar in the schooner Sutil in 1796. Some other Spanish maritime explorers who followed in Quadra's wake include José Maria Narvaez, Gonzalo López de Haro, Cayetano Valdes y Bazan, Lieutenant Francisco de Eliza, José Verdía, Juan Pantoja, Alonso de Torres, Juan Martínez Zayas and Lieutenant Salvador Fidalgo. Francisco Mourelle's journal of the voyage he undertook in 1775 with Bodega y Quadra is contained within Daines Barrington's compilation of scientific articles published in England, in 1781, under the title Miscellanies. It is not known how a copy of Mourelle's journal was acquired for English translation. Mourelle, Francisco Antonio. Journal of a Voyage in 1775. Translated by Daines Barrington. (London: J. Nichols, 1781). Voyage of the Sonora in 1775 As Translated by Daines Barrington (San Francisco: Thomas Russell, 1920; Ye Galleon Press, 1995). Juan Francisco de la Bodega y Quadra: el descubrimiento del fin del mundo, editado por Salvador Bernabeu (Madrid: Alianza Editorial, 1990). Chapman, Charles Edward. The Founding of Spanish California: The Northward Expansion of New Spain, 1687-1783 (New York: Macmillan, 1916). Bolton, H.E. Fray. Juan Crespi: Missionary Explorer on the Pacific Coast, 1769-1774 (Berkeley: University of California Press, 1927; reprint New York, AMS Press, 1971). Wagner, H.R. Spanish Voyages to the Northwest Coast of America in the Sixteenth Century (San Francisco: California Historical Society, 1929; Amsterdam: N. Israel, 1968). Wagner, H.R. Spanish Explorations in the Strait of Juan de Fuca (Fine Arts Press, Santa Ana, California: 1933; New York: AMS Press, 1971). Wagner, H.R. Cartography of the Northwest Coast of America to the Year 1800 2 volumes (University of California Press, 1937). Howay, F.W. (editor). The Journals of Captain James Colnett Aboard the Argonaut from April 26, 1789 to November 3, 1791 include 'A translation of the Diary of Estevan José Martínez from July 2 till July 14, 1789' (Champlain Society, 1940). Turanzas, José Porrua (editor). Relación del viage hecho por las goletas Sutil y Mexicana en el ano de 1792 para reconocer el Estrecho de Fuca (Madrid: Artes Graficos Minerva, 1958). Bobb, Bernard E. The Viceregency of Antonio María Buccareli in New Spain 1771-1779 (Austin: University of Texas Press, 1962). Galvin, J. (editor). A Journal of Explorations along the Coast from Monterey in the Year 1755 (San Francisco: John Howell Books, 1964). Cutter, Donald C. Destéfani, Laurio H. Tadeo Haenke y el final de una vieja polémica (Buenos Aires, 1966). Thurman, Michael E. The Naval Department of San Blas, New Spain's Bastion for Alta California and Nootka, 1767-1798 (Glendale, California: Arthur H. Clarke Co., 1967). Mathes, W. Michael. Vizcaino and Spanish Expansion in the Pacific Ocean 1580-1630 (San Francisco: California Historical Society, 1968). Cutter, Donald C. (editor). The California Coast: A Bilingual Edition of Documents from the Sutro Collection. Translated and edited in 1891 by George Butler Griffin (University of Oklahoma Press, 1969). Cook, Warren L. Flood Tide of Empire: Spain and the Pacific Northwest, 1543-1819 (New Haven: Yale University Press, 1973). Colecciones de Diarios y Relaciones para la Historia de los Viajes y Descubrimientos, VII: Comprende los viajes de Arteaga en 1792 y de Caamaáo en 1792, por la costa NO. de America, Consejo Superior de Investigaciones Ceintificas (Instituto Historico de Marina, 1975). Fireman, Janet R. The Spanish Royal Corps of Engineers in the Western Borderlands, 1764 to 1815 (Glendale, California: Arthur H. Clarke Co., 1977). Engstrand, Iris H. H. Spanish Scientists in the New World: The Eighteenth-Century Expeditions (Seattle: University of Washington Press, 1981). Kendrick, John S. The Men With Wooden Feet: The Spanish Exploration of the Pacific Northwest (Toronto: NC Press, 1986). Cutter, Donald C. Malaspina and Galiano: Spanish Voyages to the Northwest Coast, 1791 & 1792 (University of Washington Press/Douglas & McIntyre, 1991). Bartroli, Tomas. Brief Presence: Spain's Activity on America's Northwest Coast, 1774-1796 (Vancouver: Self-published, 1991). Kendrick, John S. (editor). The Voyage of the Sutil and Mexicana, 1792 (Spokane: Arthur H. Clark, 1991). Bartroli, Tomas. Genesis of Vancouver City, Explorations of its Site-1791, 1792 & 1808 (Vancouver: Self-published, 1992; 1997). Inglis, Robin (editor). Spain and the North Pacific Coast (Vancouver Maritime Museum, 1992). Kendrick, John S. Alejandro Malaspina: Portrait of a Visionary (McGill-Queen's University Press, 1999). Williams, Glyndwr. Voyages of Delusion (Yale University Press, 2004). [Alan Twigg / BCBW 2012] "QCI" "Spanish" "1700-1800"